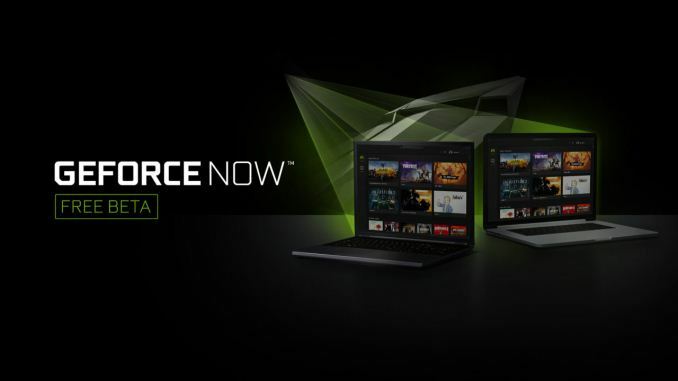 LAS VEGAS, NV — Today at CES 2018, NVIDIA announced PC availability of the GeForce NOW, their cloud-based game-streaming service, as a free closed beta. Not to be confused with the identically named GeForce NOW subscription service for NVIDIA SHIELD, the GeForce NOW service for Macs and PCs is a compute time rental service, with players renting a stipped down virtual machine that can be used to run already-owned games from Steam and other services. The Mac beta launched last summer, with PC support coming just today. Both iterations utilize a waitlist and so interested users must sign up to receive invitations for the free beta. Game-streaming services are not new to NVIDIA; as mentioned earlier, the NVIDIA SHIELD's game-streaming service is also called GeForce NOW, changing from GRID when it eventually launched in 2015. That commercial service continues to exist, where a monthly subscription allows the user to stream the performance of a GeForce GTX 1080 for select games. At CES 2017, NVIDIA then announced GeForce NOW for Windows and macOS based systems, looking to operate with a multi-tiered hourly rate. That service did eventually launch with a Mac client as a free beta over the summer, but it's only now, a year later, that NVIDIA is releasing a PC client in some form. As for how the service works, gamers essentially rent server compute time to stream a virtual desktop. Since GeForce NOW supported games must be owned or purchased on the appropriate digital store (Steam, Ubisoft Uplay, Blizzard Battle.net), those libraries must be connected to the service, though game patches and drivers are automatically installed. Similarly, cloud saves are enabled for cross-platform use. Ultimately, NVIDIA has stated the capability of streaming 1080p at up to 120fps. During the free beta, there is a limit of 4 hours per gaming session. Any amount of games may be installed, as NVIDIA states that game storage is unlimited. Today’s GeForce NOW beta is available for “most of North America and Europe” and is compatible with a number of Window- and macOS-based desktops and laptops. Windows systems require Windows 7 or better, Intel i3 at 3.1GHz or faster, 4GB RAM, and a minimum DX9 GPU; NVIDIA lists the GeForce 600 series or newer, AMD Radeon HD 3000 series or newer, and Intel HD Graphics 2000 series or newer. Additionally, GeForce NOW requires a minimum 25Mbps internet download speed via either hardwired ethernet connection or 5GHz wireless router. A list of tested macOS systems can be found on the systems requirement page. In terms of availability, the full release date was not disclosed. As for the time being, NVIDIA is running it as a free beta, with CES 2017's previously announced paid plans having been put on hold. Interested users may sign up for the waitlist.